Mixers is a line of modular jewelry. The product's novelty presented some incredibly fun and unique challenges across both print and web to communicate and sell a product unlike anything else out there. I worked with Megan Cummins to develop the brand, strategy and collateral to bring this line to market. Mixers let you mix different bases (necklace chains, bracelets) and baubles to design your jewelry. In addition to needing a customizable commerce experience, we knew half the fun of Mixers would be making and sharing different designs. 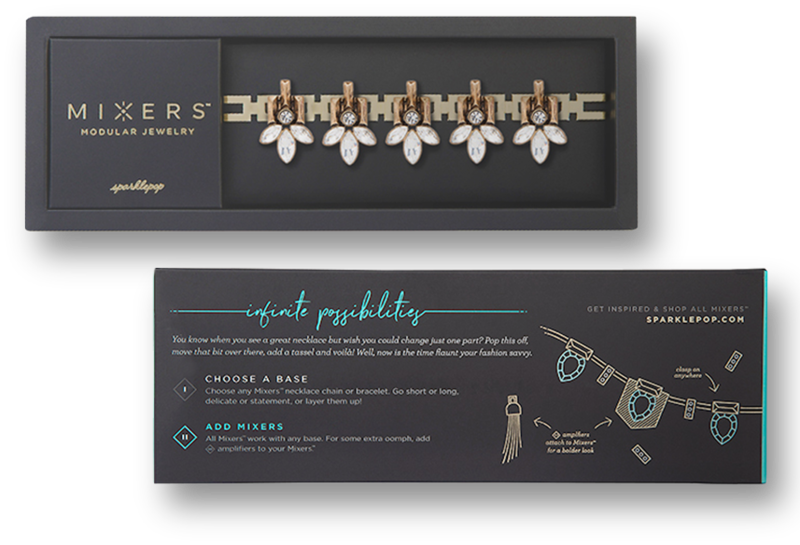 We developed a step-by-step strategy to communicate how to design Mixers that would be applied to both the packaging and in store materials as well as the digital builder experience. Customers start by choosing different chain styles or bracelets. Each base has a variety of potential drop points for Mixers. Across the brand in print and online, bases are always represented as "part I" with a pink color. Depending on the base, they can be snapped on almost anywhere. When a user begins dragging a Mixer, available drop points highlight. Across the brand in print and online, Mixers are always represented as "part II" with a mint color. In addition to sharing, we wanted to make sure other users could use a shared design as a starting point—bouncing different ideas back and forth. The user's design in progress was the main canvas for the app, with UI taking up as little space as possible. We used subtle (and not so subtle) contextual animations to avoid too much instructional text. The physical experience was more challenging than the digital one, and really helped develop the over-arching story of Mixers. We had to decide how to sell items—how many would come in a set, what was the best value for an end customer and the best margins for the business, etc. We also knew we'd have much less control over the physical experience. We needed to communicate and sell the idea to wholesale boutiques who could then place the line in their store in any number of ways—and we needed to ensure customers would understand the idea of Mixers and their possibilities without relying on signage and displays. We focused the story on steps — first, choosing a base, and then adding Mixers. We used a bright, color coded roman numeral graphic on black so that customers would understand the process no matter how products were displayed in store. We settled on selling Mixers in sets of 3s and 5s for both cost, and because the odd numbers let customers design the most interesting looking pieces. While cutting from shot to shot on beat with music isn't exactly innovative, it helped to perfectly convey that Mixers can quickly change—and it allowed us to introduce the concept and show off dozens of combinations with a pop.